Pfc. 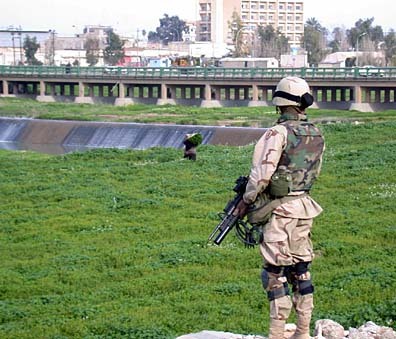 John D. Amos II stood guard recently along a river bank in Kirkuk. Amos died from injuries suffered in a blast on April 4. This week started off the same way the last one ended. We continued our knock-and-search technique in a different neighborhood. This time we went to a small village called Amu Shabi. This is probably one of the two or three poorest neighborhoods in the Alpha Company sector. >> It allows us to be a visible presence in the community and evaluate the living conditions and survey possible sites for improvement. >> We think we may find wanted personnel, contraband or illegal weapons by searching each house in the village. >> Concerned citizens will approach us with information leading to the prior two. All three happened that day. It took us about 7 1/2 hours to visit every household in the village, but it was profitable. March 28 >> Just received a message to have a platoon of soldiers at a location to meet with an informant on a possible raid. That's all the information we received so we ramped up 1st platoon and 15 minutes later we were rolling. Arriving at the location we met with some intelligence people and they gave us the targets. This one will be satisfying if it's successful. We have the lead on the guys that killed the twin brothers at the police checkpoint last week. Led by an informant, two houses were targeted. We were going to hit these two houses simultaneously. The first went down with no problems, 2nd Squad was in and pulling people out of bed. We separated the males from the women and both of our interpreters started questioning procedures, and then shots rang out from the other residence. I looked around the wall to see the squad leader pumping shotgun rounds into the locked door. We found out later, every shot hit a lock on the door, all six. One soldier spotted someone running across the roof as the squad was entering the house. After clearing the residence, they moved to the roof to look for the runner. Yelling came from the rear of the house. The soldiers that surrounded the rear said a fat guy came running out the back door. They yelled for him to stop but he didn't, so a short game of tackle football ensued. Just then I was notified that we found the guy that ran across the roof. He had trapped himself in a locked courtyard. Through all the confusion every resident was finally rounded up and segregated. Again two interpreters went to work trying to identify all personnel. The night ended with the best news of all; all targeted bad guys were identified and detained and no Alpha Company soldiers were injured. Soldiers must be prepared for various types of missions, almost every day, from searching for wanted personnel and illegal arms to scouting sites for improvement. March 30, 2000 hours >> Word has come across the radio that the rocket attack this evening may have caused some casualties. This will be the first time these guys have actually hit anything big. Later, we learn that 11 people were injured, treated and some evacuated for further care. All of our prayers go out to our brothers injured. Again I get that sick feeling in my gut. We are the best trained and most powerful Army in the world, yet we can be so vulnerable at times. I gathered all my platoon sergeants tonight to discuss all the events. We all agreed that we are trained to fight the enemy in front of us and react and kill the hidden. On Wednesday the 31st, we continued our knock-and-search missions in the north end of our sector. This time nothing major was confiscated, but the local residents gave some good information to us. We ended the day serving an eviction notice. This is rare for us to do, but we had some unauthorized people squatting in an unoccupied government building. We weren't sure how they would react, so we gave them 24 hours. The next day we returned, not exactly sure what we were going to find. To our amazement, the building was vacant. The month ended with two big promotions. Our executive officer, 1st Lt. Brad Hartz, San Antonio, Texas, was promoted to captain and will be moving to battalion staff at the end of April. He and I have established a pretty good rapport over the last few months. I hate to see him leave, but his promotion opens the door for another junior officer to excel. Spec. Clinton Brewer, Oakland, Calif., was promoted to sergeant. He has probably been the top team leader in the company for quite some time. I just hope he is ready to stay focused and continue what could be a successful career. April 4, 1558 hours >> We were conducting a traffic-control point and an explosion rocks the ground from about 750 meters away. I look up and see a whitish-gray cloud rising into the air. I immediately rounded up one of the squads and moved toward the blast. I found myself having a hard time concentrating on the move over. Was that a rocket, mortar or improvised explosive device? How many people were hurt? Who was near the blast? I found myself continually shaking my head and blinking my eyes to clear my thoughts. As we were approaching the area I saw a few coalition vehicles and thought they were in control of the area. I saw the ambulance drive away and my heart stopped. I arrived at the sight and noticed a damaged ambulance. I looked around and saw small pieces of car debris that reminded me of the police station bombing in February. I knew right away this was a car bomb. My medic, Staff Sgt. Mendoza, started treating the soldiers and civilians that had not been evacuated yet. I talked to a platoon leader and the company commander of Charlie Company, Capt. William Venable. They had the situation well under control. April 4, 2235 hours >> I have just been informed that one of the soldiers injured earlier, Pfc. John Amos from Charlie Company, died of his wounds on a helicopter transporting him to higher medical treatment. The rest of the week is irrelevant compared to the loss suffered by Charlie Company. Pfc. John D. Amos II, who died from injuries suffered in a blast on April 4, was well-respected and remembered as a good friend by his fellow soldiers. I'm going to break from my usual profile of 25th Infantry Division soldiers to let the people of Hawaii know exactly what a special soldier Pfc. John D. Amos II was and how much of a loss this really is. Pfc. John D. Amos II was born March 8, 1984. Amos, from Valparaiso, Ind., came into the Army in the fall of 2002 and arrived at Schofield Barracks just before the New Year. This was one special soldier. I talked with his leaders and peers and they all agreed; he always gave 100 percent on and off duty. Pfc. Daniel Collins from St. Albans, W.Va., said Amos was probably the best friend he's ever had. "He loved the Army and he never said no," Collins said. "He had this witty attitude about him, but would always help anyone in need. He would always invite me to his place to hang out or go to the beach. When I was feeling down, he was always the first guy there to cheer me up. I felt we were like brothers." Amos' squad leader was Sgt. Jeffery Adkins from Franklinton, La. "He was definitely an integral part of the squad," Adkins said. "He was so well-liked and respected by his peers and leaders. He will definitely be missed. If he was here, he would tell us we need to continue the mission, so we are going to do it for him." Cpl. Keith Jackson from Virginia Beach, Va., was the team leader. He said Amos was one of the top soldiers in the company. 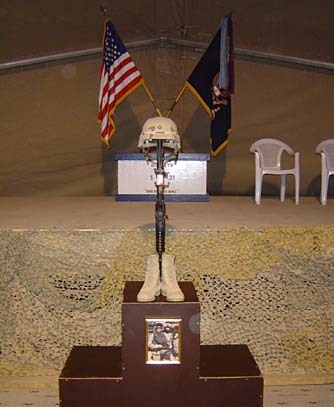 A memorial to Pfc. 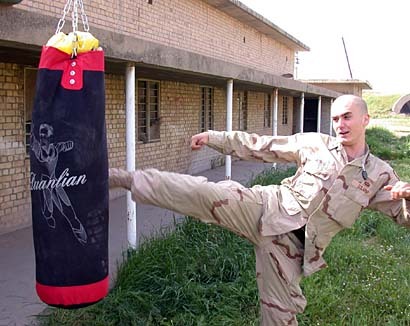 John D. Amos II, including the symbolic boots, rifle and dog tags, was set up Thursday in Kirkuk. "He proved it by earning his Expert Infantryman Badge first time out," Jackson added. I asked him to sum up Pfc. Amos in a few words. He said, "Always gave 100 percent, he was so determined that he would have achieved any goal. He was always a good friend to whoever was in need. His family should be proud of him and the way he always conducted himself." While stationed at Schofield Barracks, Amos lived in Waipahu with two other soldiers from the company. One of his roommates, Spec. Jarod Myers from Fort Wayne, Ind., said Amos was his best friend. "He was straightforward and not afraid to give you his opinion whether you liked it or not. "He was always on the go. He loved the beach and really cherished his friends. He always had to be doing something as if he was trying to squeeze every ounce out of life. He talked a lot about his family and really just wanted to be like his dad, an Airborne Ranger. 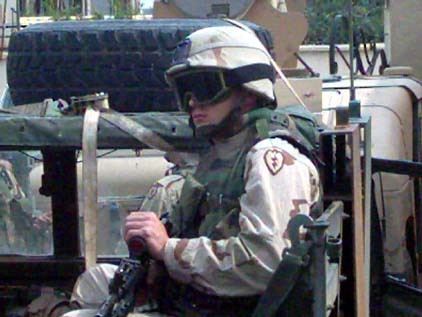 Sometimes he would talk about leaving the Army someday to work on the Las Vegas police force." When asked if there was one thing he could say that he wanted people to remember about Amos he said, "I just feel lucky to have gotten to know someone like him. He changed my life forever." Condolences come from all of the soldiers here to his family. His mother Susan lives in Valparaiso, Ind., with his sister, and his father John lives in Las Vegas with his two brothers. Pfc. Amos loved his family, loved his job, and loved life. He will be missed and we refuse to let this loss go in vain. Rest in peace John Amos, you're in His special hands now. 1st Sgt. Robert Jennings is deployed in Iraq with 4,000 25 Infantry Division (Light) soldiers from Schofield Barracks. He writes a Sunday column for the Star-Bulletin that began Feb. 1. Jennings, a 20-year Army veteran, has been assigned to Fort Riley, Kan., Fort Campbell, Ky., Fort Lewis, Wash., and Camp Casey in South Korea. He is now on his second tour at Schofield Barracks. He has been deployed to Panama, Japan, Germany, Egypt and Thailand. As the first sergeant of Alpha Company, Jennings is in charge of 135 soldiers. See the Columnists section for Jennings' earlier dispatches.